Let’s say you have severe ME/CFS, and you’re married to someone who has a full time job, is your sole caretaker, and because of the severity of your illness, is also chief cook, bottle washer, launderer, yard maintenance guy, and additionally, the one who puts the food in front of the cats and takes care of the product of the other end. It can lead one to feel as if one is not really doing much to help around the house except for making sure the couch doesn’t somehow float away. The bath in question. Among other things, it needs paint – I hate mauve, and would like it a light Tiffany blue – but I need paint fumes like a hole in the head. But you want to help, so you pledge to yourself to help keep one bathroom clean. And that’s the truth of the matter: you can’t really clean a bathroom, but if you can function upright for about twenty minutes a day, total, most of the time you can use two or three or five minutes of that to keep one very small bathroom clean. Mostly. You don’t try to clean it all at once. Of course you can’t, in two or three minutes – but you can get it done in that time over the course of a week by attacking one thing a day. I picked up this divide-and-conquer method from using FlyLady some years ago, when I was housebound but still working and while significantly ill, much more physically able than I am right now. Her approach of doing a little at a time rather than my historic habit of trying to go at everything in an occasional overwhelming, discouraging, unpleasant blitz is not only helpful to housework haters; it’s good for the sick and low-energy among us, too. Over time, I’ve adapted her approach, making small tasks even smaller so they’re manageable for me. I do my cleaning on my way to bed, because that’s my best time of day. Since you can’t do a lot of walking, it’s vitally important to have your tools at hand. Under the sink is a spray bottle containing a mix of water, vinegar, and Dr. Bronner’s, a can of Bon Ami, a scrubby sponge, a roll of paper towels, a pack of alcohol wipes, and a pair of work gloves – loosely fitting ones, so they’re easy to slip on and off even with low energy. (You may notice that none of these items have added perfumes, which is necessary for those of us who are sensitive to smells. The alcohol wipes aren’t quite as good as glass cleaner, but I haven’t been able to find a glass cleaner or glass wipe I can tolerate.) A toilet brush is in a holder next to the toilet. 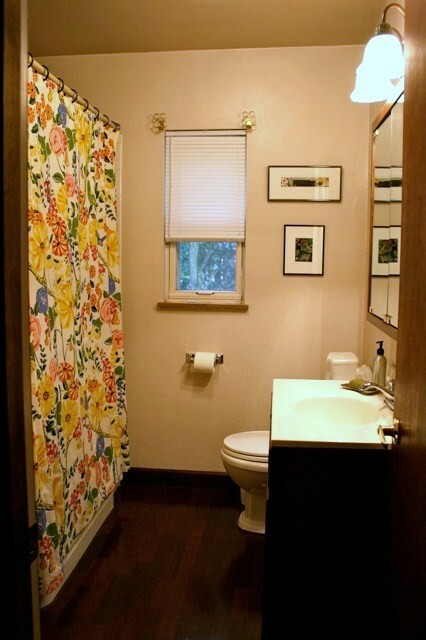 The other thing necessary for easy bathroom maintenance is a well-ordered linen closet. In the linen closet, there are neat stacks of hand and face towels, and a large stack each of facial washcloths and “presentable” washcloths. On a tray that can slide out, making it easy to access, there are rolls of toilet paper, boxes of paper cups, a stack of backup bars of soap, and other things needed at hand but which are less presentable, like tissues, toothpaste, toothbrush, and a bottle of mouthwash. The less that there is to sit on the counter in the open in such a tiny bathroom, the less there is to fuss with when cleaning. With all that in place, you’re ready to go. Monday is mirror day. Get out an alcohol wipe, and use it to wipe the mirror clean of smudges and spots. Take a paper towel and buff the mirror dry. The rest of the week, make assiduous effort to avoid spotting the mirror with splashes so as not to need to do it again before the next Monday. Tuesday is toilet tank, seat, and bowl day. Fetch your spray bottle from under the sink, along with the roll of paper towels. Spray the tank and seat down and wipe. Spray the inside of the bowl, scrub, flush, and then go lie down, because trying to use your atrophied back muscles to bend over and scrub like that for half a minute was exhausting. Wednesday is wall day. This particular bathroom has seven walls, counting three of them as the tiled bathtub enclosure, and includes two doors. Pick the particular wall or part of a wall it’s been the longest since you addressed. Spray with aforementioned cleaner, and wipe as best as possible. Do at least half of this sitting down, because bending over is Bad News for your heart. If you’re having a bad day, this can always be skipped, or if you had a bad day during another part of the week, you can skip doing a wall and do whatever you missed previously. On Wednesday, also change out your facial washcloth. Thursday is toilet exterior day. Sit down on the floor and spray the base of the toilet with cleaner. Wipe. Once in a while attack the baseboard and wall behind the toilet while you’re down there. Friday is floor day. This is another that can be done sitting down, but is also the thing that takes the longest. Grab a couple of washcloths (there are always one or two that have been used for one bath lying around), spray the floor in front of you with cleaner, and working backward, wipe the floor toward you. This could not be called extremely thorough, but as long as it gets done every week or two, it keeps the dust and hair situation on the dark laminate floors pretty well under control. Take a stab at a baseboard in the process if you can manage it. Saturday is sink day. When you have a bath, you take the soap dish into the bathtub with you and scrub it with a washcloth after soaking it, and you keep a presentable-looking washcloth on the countertop all the time so you can wipe down splashes on the counter and faucet each time you use the sink, so this task doesn’t take a ton of effort. Spray the counter and faucet with cleaner and wipe, then sprinkle Bon Ami in the basin, go over it with a scrubby sponge and rinse. Sunday is surface day. Pick something that hasn’t been sprayed and wiped for a while – a windowsill, tub edge, towel bar, part of a light fixture, the cabinet fronts, top of a door, etc. – and go to town. This is a day that can be skipped if you get to this point in the week and need a day off, or need to make up a day you didn’t catch in its regular rotation. On Sunday, you also change out your hand and face towels, your facial washcloth, and the washcloth you keep sitting on the countertop. Now, at this point you may say, “What about the bathtub?” And there’s the rub. (Sorry.) I cannot really effectively do the bathtub. The combination of force, angle, and exertion needed is more than I can afford to expend. So Chimp does the tub itself, using Bon Ami. The handy thing about a schedule like this is that if you can mostly follow it, the bathroom doesn’t ever get away from you, and even if you miss a day and never get to make it up over the course of the week, two weeks going by on most of this stuff is still not the end of the world. The rest of the house may not get cleaned as often as I would like, but I content myself that there is little possibility of being able to make a difference for the entire house by spreading the energy I have across it, since just getting to some rooms is more than I can do on a regular basis. So, as in so many other things, I try to forget about what I can’t do – in this case dispatch the dust bunnies that are surely rampaging elsewhere – and be satisfied with my clean little bathroom. This entry was posted in House & Home, ME/CFS and tagged bath, Chimp, cleaning, daily routine, house & home. Bookmark the permalink. What a plan! I am so proud of you and Chimp. Go Girl! Glad to hear it, Rachel! Thanks. It is a big job! There are so many surfaces that need different approaches that it can be overwhelming. Great post – it touches on so many of our challenges. If you’re ever looking for an alternative to alcohol wipes, Seventh Generation Natural All Purpose Spray Cleaner (Free & Clear) works well on glass (and pretty much everything else) and is totally not stinky. It’s one of the few cleaners I can use. I’ve been looking for an odorless scrubby cleaner for the tub. My husband has to tackle this chore too because it requires too much strength. Tried baking soda, but that doesn’t work so well. Maybe we can try the Bon Ami. Hopefully there is no smell? Thanks for the tip, POTSNJ. I will have to see if Chimp can find some of the Seventh Generation cleaner. I have had success with a lot of their products in the past, going all the way back to when I was working at Whole Foods in the 90s, and I think I may have used their glass cleaner then. We live in a little tiny burgh, so specialty stuff is a little tough to find sometimes. The Bon Ami product I’ve been using a similar length of time is their powder cleanser in the yellow can. You could also use the 1886 formula in the red can. (There is also a version in a gold can with similar, rather confusing labeling.) The stuff in the yellow or red can is unscented. It contains no bleach and is less abrasive than a Comet or Soft Scrub (their longtime motto is “hasn’t scratched yet,” with a baby chick), so it is not quite equivalent to other bathroom cleansers, but that’s part of why I like it. You will probably want to see if you can get one can first to see if it agrees with you. I think Ace Hardware carries it. That sounds handy and can certainly be a reality situation for many of us. My boyfriend was frustrated and going to me not long ago “why cant you just clean the bathroom basin” (it was very dirty) and trying to get me to do so, I told him cause Ive been busy doing other things. He doesnt understand how one little job which really only takes a few minutes (thou my basin probably would of taken longer that day), I cant fit into my already too full days of things I should be doing. All those 100s of little jobs about the house sure add up fast and its always a case of which ones are going to get done today. When im worst, like you I will focus on just one room to at least have one room in my house I know is clean. One can take pride in one room clean, even if its only something like the toilet room of the house (the bathroom is harder then the toilet room). My sympathies, Tania. It’s not hard for hundreds of tiny things to add up to Too Much over the course of the day. We know what that calculus is like inside, but our loved ones aren’t always privy to our experience of making those morning-to-night calculations. I wrote a post sort of along those lines last year that might be illuminating to your boyfriend – sounds like you are fortunate to have a bit more capacity than I, but the concept is the same – A Thousand Things. I can use this because vinegar smell doesn’t bother me. You could try it. Thanks, Judy. That’s quite similar to what I mix up as an all-purpose cleaner, though my mix has a lot more vinegar. I will have to give that a shot. Brilliant post! well done for breaking things down and not being discouraged by what seems like an impossible task! You are a great inspiration to others! The bathroom is also my only bathroom chore, also spread throughout the week. I do the bathtub at the end of my bath, swishing the washcloth around the waterline and then along the rim of the tub. Unless I put oil in the bath (which I only do if my skin gets particularly dry) that’s enough to keep the bathtub clean enough for us. That’s a good idea, Happy. I’m usually so tired at the end of a bath (exertion + hot water) that getting out and lying down is about all I can manage! It’s a huge spoon hurdle to get into the bath, but I always bathe with epsom salts, and that revives me a lot. I still have to rest after a bath, but I nearly always feel better for it. Yes, I usually feel better afterwards too – helps with the pain for sure. I envy you the use of epsom salts – they seem to help so many of us, but I have a mag sulfate intolerance. Bathroom? What bathroom? I do tiny things like wipe out the sink when I brush my teeth or clean a bit of the tub’s tile while I’m sitting in it taking a shower. Yes! I have had a wonderful bench in the tub gotten from Bigelow’s Pharmacy in New York. It has saved me numerous times from all-out griminess. I use a sponge mop on the floor here and elsewhere. It takes a minute or two and i do not have to strain. I’m afraid my bathroom does not get a thorough cleaning very often. I do a few minutes here and there. My big hassle is keeping the kitchen clean and getting garbage out of here a few times a day, now having to recycle a lot of items — and clean many out first. Then getting the bags to the basement. I will note your method and bookmark this page. I appreciate the comment about the 7th Generation spray. I use their products for laundry (although only a bit as it does leave a chemical smell) and their dishwashing liquid. Trash definitely has to be the priority where you are! Sounds like you have some good strategies too, K.
Xoxo all the best.. back to resting. Joanne, I had a ton of cut-up t-shirts for a while for that purpose. I think they all got ditched in the last move, though. I miss wine glasses too…sigh. I enjoyed reading this and I agree about the bath too it’s a step beyond! I’m not as severely disabled as you but for me the weekly bathroom clean was the one chore that I ruminated on every day, leading to guilt and stress when the family came home. With some reservations I now employ a cleaner. Here’s the great thing though. They come once a fortnight, two people, for half an hour for ten pounds. They hoover the stairs and kitchen floor. They clean the bathroom and downstairs toilet. Its the best fiver a week I ever spent. On the back of their clean, I sometimes tidy something or clean the kitchen with a light heart. My other half doesn’t have to clean the toilets and I know that it will all be done again in two weeks. Whatever my health. That’s a great idea, Lorraine. I haven’t been able to get over that hump of paying for something I feel guilty that we “should” be able to do ourselves. Of course there are so many extra “have tos” that Chimp is subjected to because of my illness…maybe I could let go of some of those “shoulds” as a result, right? Paul here from Cedar City, Utah. I have FM and can relate very well to your bathroom compartmentalized cleaning system 😀 Although, I rarely get it all d one on consecutive days.